Google and Apple won't be getting together anytime soon. In the ongoing battle between Apple and Google, the two companies have made public letters to the FCC about the iPhone maker's controversial blocking of Google Voice from its app store. Apple decided to make its letter to the FCC public after several Freedom of Information Requests were filed with the FCC for the letters. After initially hesitating, Google decided to follow suit and allow the FCC to release portion of the letter. "When we submitted our letter on August 21, we asked the FCC to redact certain portions that involved sensitive commercial conversations between two companies -- namely, a description of e-mails, telephone conversations, and in-person meetings between executives at Google and Apple," Google said on its blog Friday. 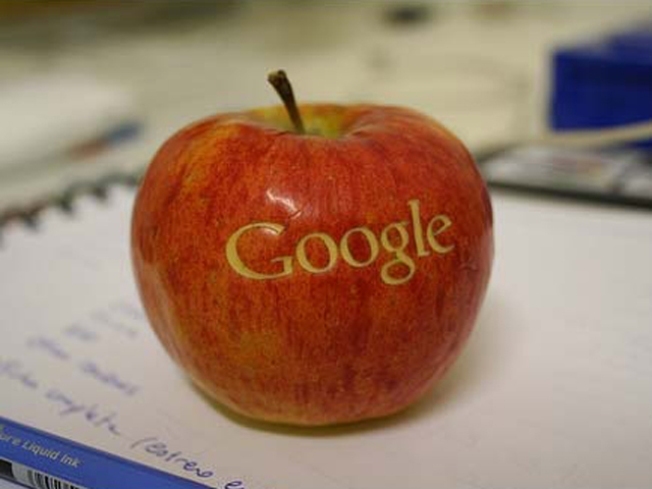 The specifics of the talks between Apple and Google were redacted from Google's original letter. The Mountain View, Calif.-based company allowed the FCC to post an unredacted version Friday "in the interest of transparency," according to Google's blog. Google's letter describes what its Voice product does and how it would work with the iPhone and it also explains why Apple rejected the app. Google said Apple's top marketing executive personally told the company that the application was rejected because it duplicates the telephone dialer on the iPhone and could be used as a replacement. Apple said Friday that the two Silicon Valley companies are still discussing the application. The Federal Communications Commission is looking at Apple's block on the Google Voice app as part of a bigger investigation into how wireless industry practices affect consumers. In August, Apple, Google and AT&T, the only wireless carrier to offer the iPhone in the U.S., sent the commission letters responding to its questions. Google Voice lets people pick a new phone number, then route incoming calls to cell, office or home phones. It also lets users place calls, including international calls at low rates, from within the application. IPhone owners can still use a Web browser version of Google Voice, but its features are limited. In a section of its letter that had originally been redacted, Google said Phil Schiller of Apple told Google's Alan Eustace, a senior vice president, during a July 7 phone call that Apple was rejecting the program. Google also made public Friday some details related to Apple's rejection of the Google Latitude iPhone app, a map application that lets people share their location with friends. Google said Apple rejected that program because it had the potential to replace Apple's own maps program or "create user confusion" over the two companies' programs. Schiller and Eustace met in person in April, Google said, at which point Schiller laid out the reasons for the rejection. One-time allies Apple and Google now find themselves competing on a growing number of fronts. Google has its own mobile phone software, Android, that powers phones that compete with the iPhone. It recently announced plans for a computer operating system that could challenge Apple's Macs. Google CEO Eric Schmidt resigned from Apple's board in early August, after regulators from the Federal Trade Commission questioned his dual role's effect on competition in the industry.